What is Sparkly Shoes & Kindness day? A few things about kindness that recently caught my eye from around the internet. Some I have already posted on my facebook page. These young men stayed behind to care for elderly residents with nowhere to go in a rest home that closed down unexpectedly. Click the photo to hear the story in their own words. This is an ordinary story, one that happens across the world in many different ways, but nonetheless one worth recounting. I’m sharing this post from last year to invite you all to eat ice-cream for breakfast on the 18th February. I’m planning to, come back and tell me if you do too! 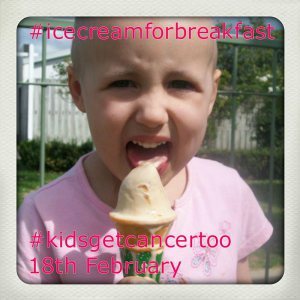 You can also use the hashtags #icecreamforbreakfast and #kidsgetcancer too on social media networks. There will be people around the world eating ice-cream for breakfast on 18th February. And despite being in two minds about cancer awareness campaigns, I’m going to be one of them. Here’s why. Generally I prefer charity activities that raise money for their causes over “awareness” campaigns that seem to do little other than make people feel good about participating. I am planning on supporting Eat Ice-cream for Breakfast Day though. It doesn’t raise money. It doesn’t have an ice-cream company as a corporate sponsor. Yes, it is an awareness campaign for childhood cancer, motivated by remembering a little girl called Malia but it’s asking something a little bit different from you too. A few months ago, I wrote a post on The things we keep, the things we sent, the things I let go. I deleted a whole section at the end that I wasn’t ready to share.